WASHINGTON�(CNNMoney) -- Switzerland's government moved Friday to freeze any assets in the country's banks that might belong to former Egyptian President Hosni Mubarak or his family, the Swiss Federal Department of Foreign Affairs said Friday. An official statement from the Swiss Federal Department of Foreign Affairs said the Swiss cabinet had frozen all funds belong to Mubarak or "his circles." "The [government] intends in doing so to avoid any risk of embezzlement of Egyptian state property," the statement read. "At the same time, the cabinet calls on responsible authorities in Egypt to comply with the justified demands of the Egyptian people in a quick, credible, participatory and transparent manner." The government does not know what assets, if any, the banks have, said Norbert Baerlocher, a spokesman for the Swiss embassy in Washington. 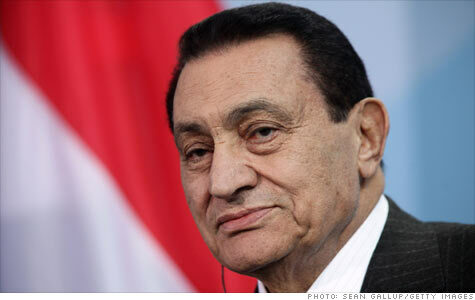 It is widely believed that Mubarak and his family are extremely wealthy, but estimates as to his total net worth vary widely and haven't been confirmed. On Tuesday, the Swiss finance minister had asked the banks to see what Mubarak assets they were holding. The banks do not yet have a "clear picture" of what is held, the spokesman said. This is normal procedure when the Swiss government believes there might be assets of a foreign leader who is "politically exposed," Baerlocher said. The Swiss banking system is known for its secrecy. But in recent years, the banks have made concessions in the interest of providing more transparency. The lack of action by foreign governments to freeze Mubarak's assets as the protests unfolded was a "deep source of frustration" among the Egyptians protesting in the streets, according to Amaney Jamal, a Princeton University professor who is director of the Workshop on Arab Political Development. Jamal told CNN's Kyra Phillips on Tuesday that the protests were spurred by the perception that Mubarak used his power to consolidate wealth while "squandering ... the resources of Egypt." A spokeswoman for the Treasury Department declined to comment when asked if the United States would pursue a similar course. "I'm going to decline to comment, as it is not Treasury's policy to comment on possible or pending investigations or enforcement actions," Treasury spokeswoman Marti Adams said. -- CNN's Ben Brumfield, CNN's Scott Spoerry and CNNMoney's Charles Riley assisted with this report.